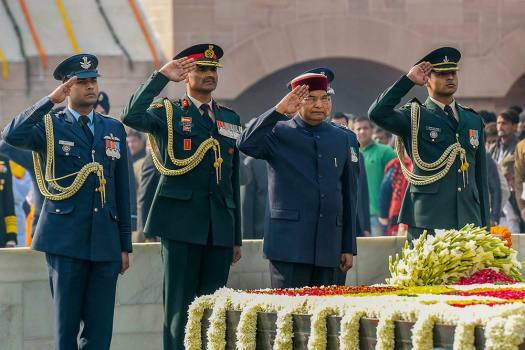 President Ram Nath Kovind pays homage to Mahatma Gandhi on his 71st death anniversary, also observed as Martyrs' Day, at Rajghat in New Delhi. 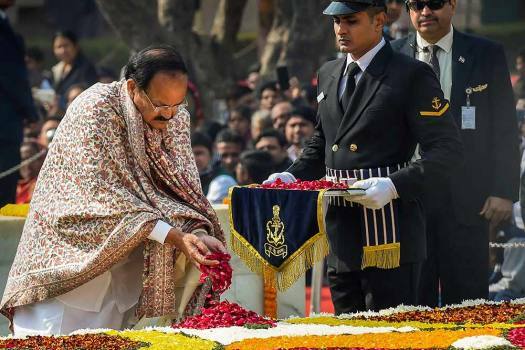 Vice President M Venkaiah Naidu pays homage to Mahatma Gandhi on his 71st death anniversary, also observed as Martyrs' Day, at Rajghat in New Delhi. 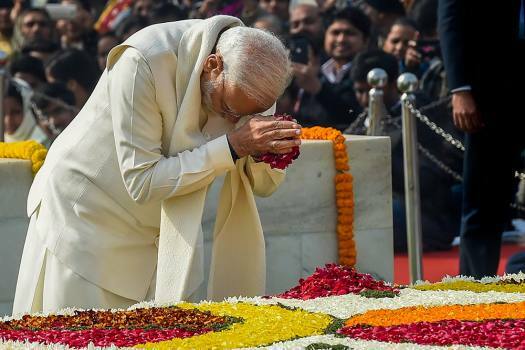 Prime Minister Narendra Modi pays homage to Mahatma Gandhi on his 71st death anniversary, also observed as Martyrs' Day, at Rajghat in New Delhi. 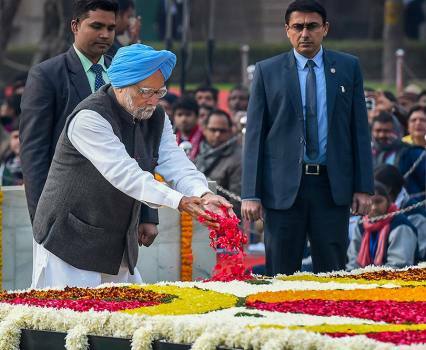 Former prime minister Manmohan Singh pays homage to Mahatma Gandhi on his 71st death anniversary, also observed as Martyrs' Day, at Rajghat in New Delhi. 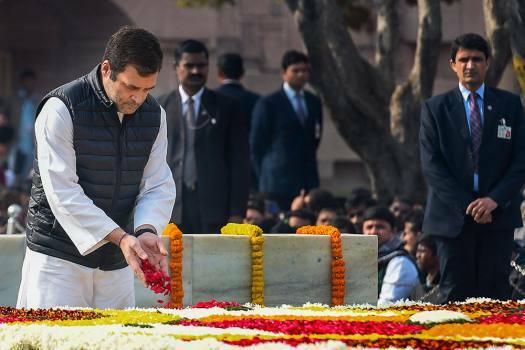 Congress President Rahul Gandhi pays homage to Mahatma Gandhi on his death anniversary, also observed as Martyrs' Day, at Rajghat in New Delhi. 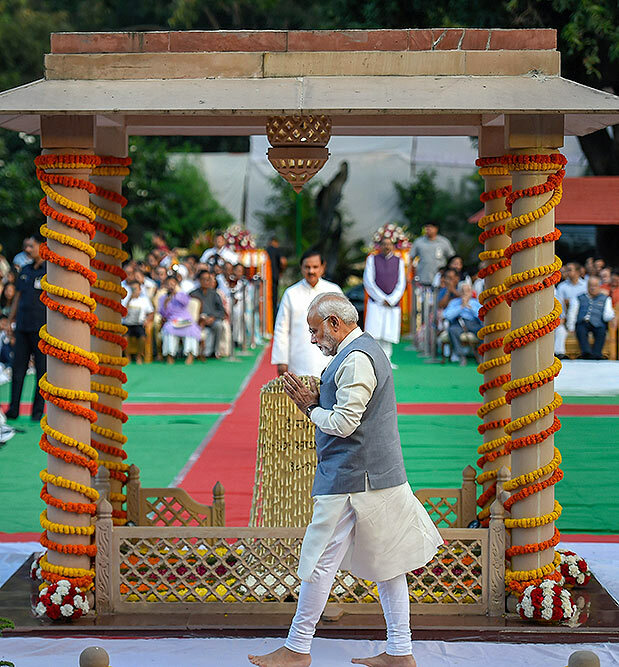 Prime Minister Narendra Modi pays tribute to Mahatma Gandhi on his birth anniversary, at Gandhi Smriti in New Delhi. 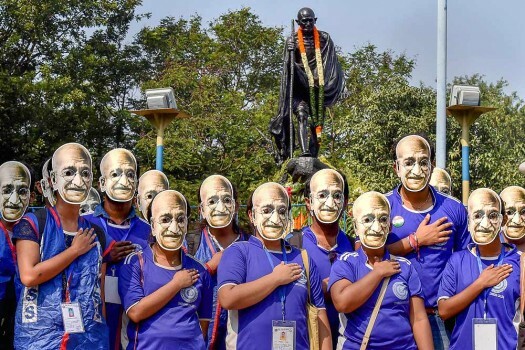 Youth wearing masks of Mahatma Gandhi pose for a photograph in front of a Gandhi statue during his 149th birth anniversary celebrations, in Kolkata. An artist dressed up as Mahatma Gandhi offers prayers to commemorate the 149th birth anniversary of Mahatma Gandhi, at Gandhi Ghat in Patna. 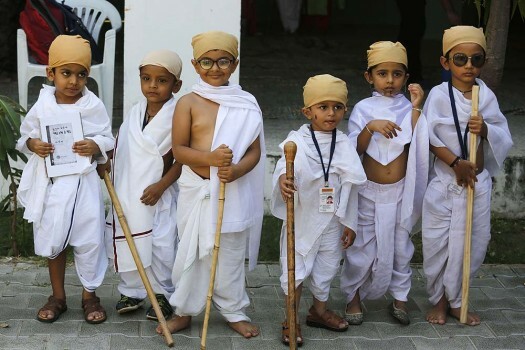 Children dressed as Mahatma Gandhi participate in a Gandhi Jayanti function, in Moradabad. 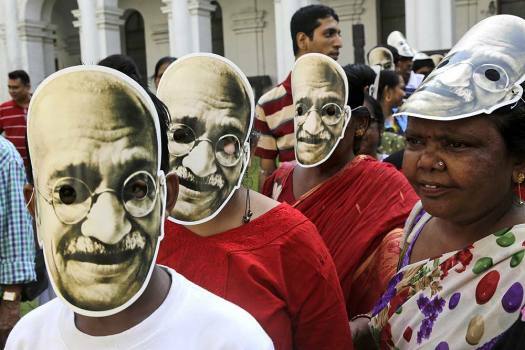 School children and teachers wearing masks of Mahatma Gandhi, the father of the nation, participate in a rally to mark the independence leader's birth anniversary in Kolkata. 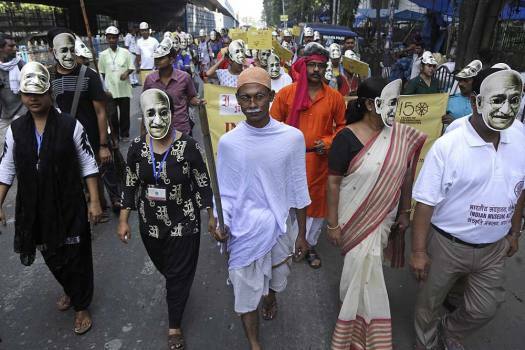 A man dressed as Mahatma Gandhi, the father of the nation, walks with others wearing Gandhi masks during a rally to mark the leader's birth anniversary in Kolkata. 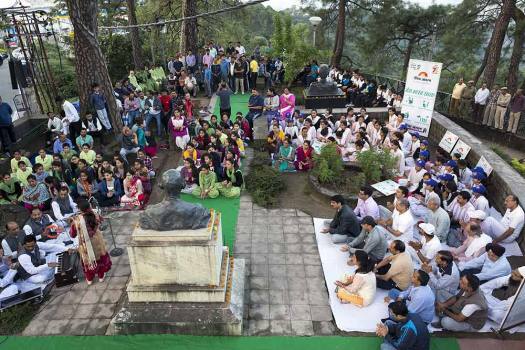 Local residents participate in an early morning prayer session to mark the birth anniversary of Mahatma Gandhi in Dharamsala. 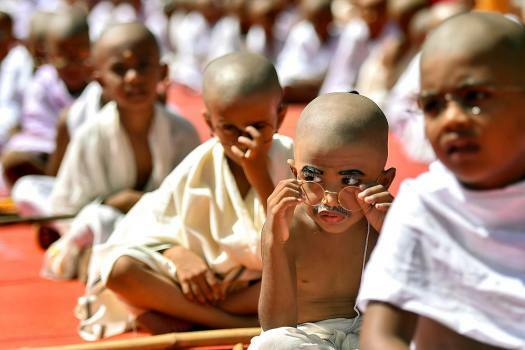 Students of a private school dress as Mahatma Gandhi ahead of his birth anniversary, in Chennai. School children stand dressed as Mahatma Gandhi at a school in Ahmadabad. 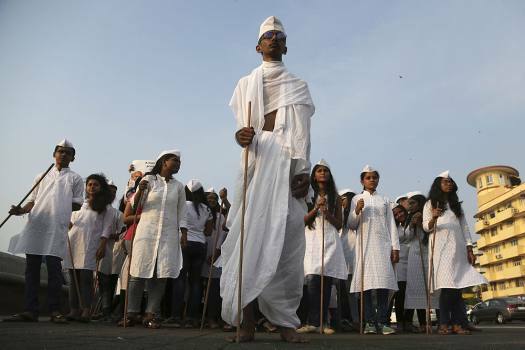 Students dressed as Mahatma Gandhi participate in a march in Mumbai. 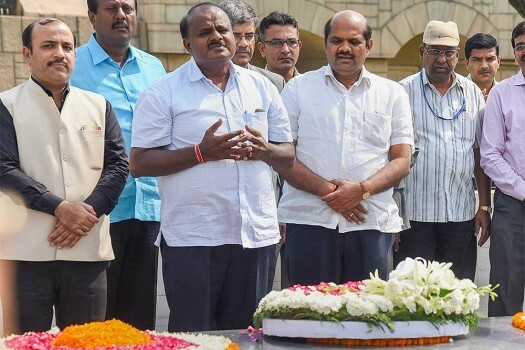 Karnataka Chief Minister H D Kumaraswamy pays tribute to Mahatma Gandhi at his memorial Rajghat, in New Delhi. 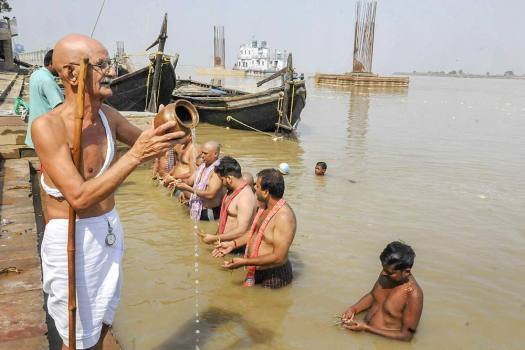 Gandhian idealism, which consumes the practitioner, could also cleanse souls. 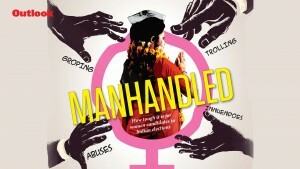 His best followers were those who cleaned toilets to become ideal scavengers. 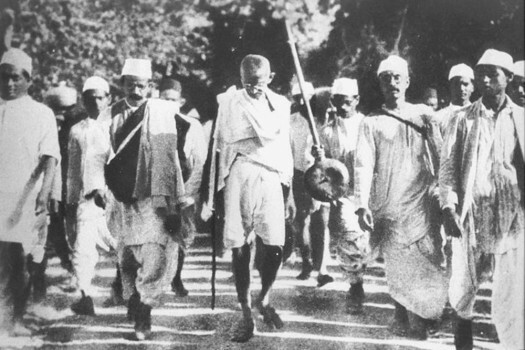 Gandhi unfurled his radical plans against rampant caste prejudice and untouchability shrewdly. Kolge’s lucid study is a brilliant analytical effort. 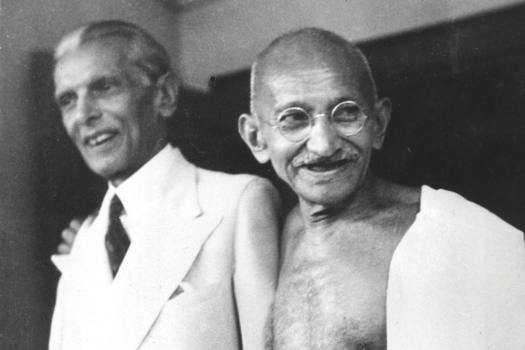 In the 21st century, the thoughts of Gandhi remain as essential as they were in his time and offer solutions to several problems the world faces. 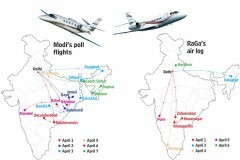 The announcement was made by Maloney during the popular India Day Parade in New York in August. 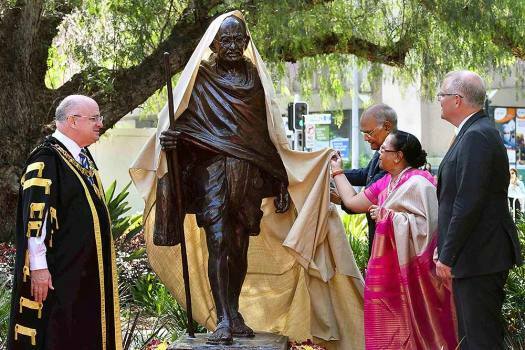 The day also marks the launch of 150th-anniversary celebrations of Mahatma Gandhi. Gandhi would be the first Indian to receive a Congressional Gold Medal, an honour bestowed upon eminent leaders such the first US President George Washington, Mandela, Mother Teresa and civil rights activist Rosa Parks. He quoted Mahatma Gandhi as saying, "When I visited RSS camp I was surprised by your discipline and absence of untouchability"